Chester Ott was born in 1924 at Pablo Ranch, Nevada. He spent every summer on the ranch after his 6th birthday and went to school during the winter in Tonapah. His uncle had a repair, welding and trucking business in Tonapah and taught Chet the trade. When he turned 15, he worked for his uncle as a welders helper and burner on jobs in the local area and up on the ranch. By the age of 17, he was driving dump trucks for the mines and by 18 was working for the Nevada Highway Department until his Army enlistment in March 1943. After his initial training at Ft. Lewis, Washington, he went to New York to bound for England in November 1943. His unit made landing at Omaha Beach in June 1944 and he served in Normandy, Northern France, Ardennes, Rineland, and Central Europe including the Battle Of the Bulge. He spent most of his time in the Army in Rigging and Recovery. "I was issued a M-10 wrecker in England. Wore it out on the continent and was issued a new one toward the end of the war. I had to sign for it, cost $31,000 and when the Germans quit, we went to Marselle and started processing our equipment to go to the Pacific- Mainland Japan. They dropped the bomb on August 6th (my birthday!) and we could go home." Chet was Honorably Discharged as a Sergeant on December 6, 1945 at Ft. Logan, Colorado. "I requested discharge in Colorado because my family had moved to Colorado and the chance of good employment was better than rural Nevada. Besides, my new Belgian bride would not survive there in November at that time." After the war Chet worked as a mechanic and truck driver in Colorado for several years before he ventured to California in 1953 where the Mojave Corporation was hiring equipment operators. Under contract from the Air Force, the operators were mining clay out of Rogers Lake for oil drilling operations. During the day they would dig the massive holes, removing the clay, and then at night back fill the holes with sand and grave for the runway's. They stockpiled over 1 million tons of clay from Rogers, which is now the site for the Air Force and NASA testing grounds at Edwards AFB. Chet started as a truck driver and soon became the mechanic Foreman. In 1956 he was promoted to take over the operations at their Norwalk location where he was to supervise repairs, purchasing and generally just clean up the operation. After 18 months he had everything straightened out and started going out on construction jobs for Mojave all over Southern California where he managed their fleet of Belly Dumps, Cat Bulldozers, Shovel Scrappers and other construction equipment. By August-September 1959 the oil fields were drilled out and Mojave was slowly going broke due to the lack of crane or oil-field work. In order for Mojave to pay the debts, they started to refurbish their trucks and equipment for re-sale. In the process they learned a new business: Equipment sales, Rental and Re-conditioning. Chet ended up managing that new operation and paid off off all of their debt. In mid-1961, Chet started the H.O.C. Corporation with Daryl Harris and Dean Clark. 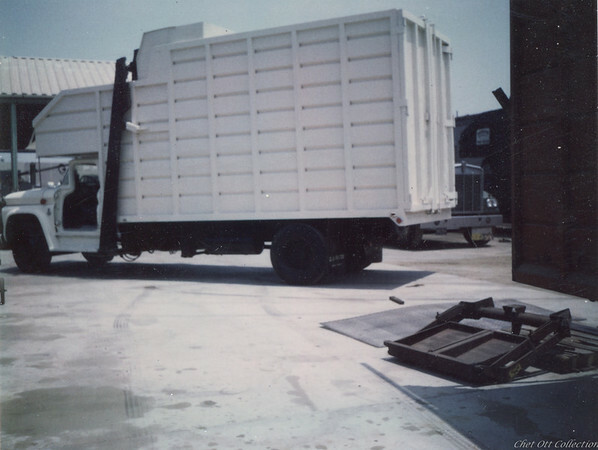 H.O.C was an independent continuation of the new business he successfully ran at Mojave and it offered repair, welding and rental of Heavy Equipment for construction companies in the Santa Fe Springs area. 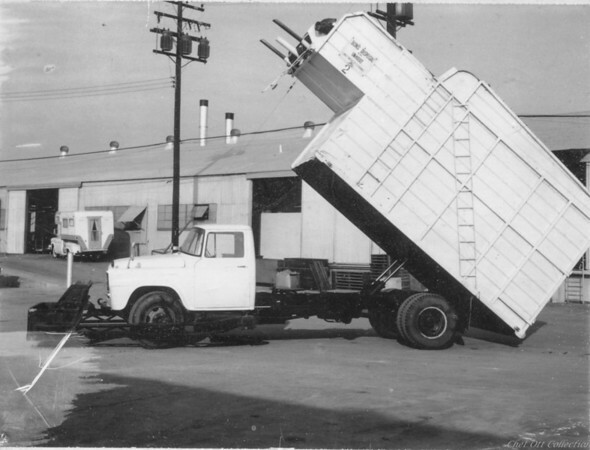 They also had local refuse companies use them for repair and maintenance of their front load trucks, which is where Chet learned the mechanics and art of refuse bodies. "In 1966 I took a hard look at the Corporation and decided that the load I carried in managing the whole thing was not good, especially if you own less than the controlling interest. Mostly it was a dead end with 2 workers and employees and the controlling interest was a free rider and maker of unprofitable deals. I built the receivables up to twice the payable's and told them that I was leaving on a certain date. I guess they didn't believe me because the HOC Corp died right then." 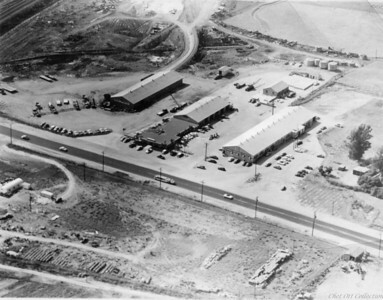 Chet went to the Hood Corporation in late 1966 where he worked on pipelines for off-shore oil rigs (that Mojave had constructed years earlier) and built specialty equipment for various construction companies. 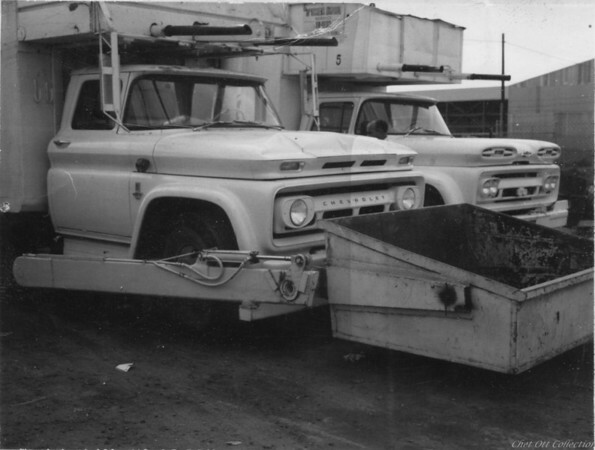 At 52 Chet decided to semi-retire, collect his pension from Hood and with that money he struck out on his own and started building garbage trucks. Hand Written Notes on Back: "Early 1960's in HOC for Repair. Note the 45 degree ladder. They later put in the Top Pack- the pipesout the front were the early track or guides." Notes hand written on back: "Typical Top Pack. 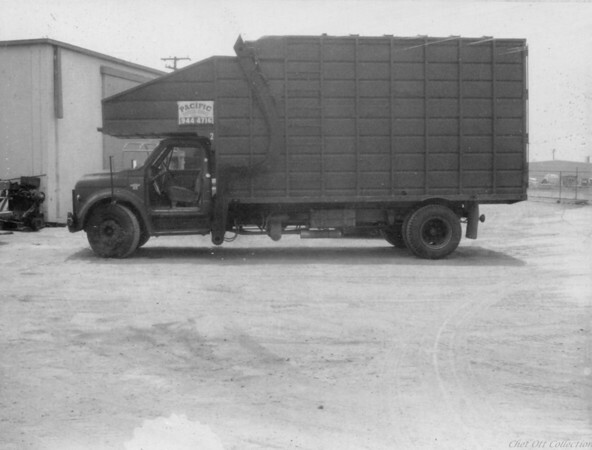 They would put on near 8 tons on the 1 1/2 ton chassis. Not real safe."